Burton. Snowboarding pioneers and masters of segmented marketing. Their kids’ programs aim to build life long boarders by capturing valuable customer satisfaction data at the point of experience. On the mountain, offline and paperless capture are crucial. Custom follow up based on quality of experience helps create brand loyalty. Asking customer experience questions on the hill provided quality feedback, measuring visceral reactions to the snowboarding experience from two market segments, the parents and the child. 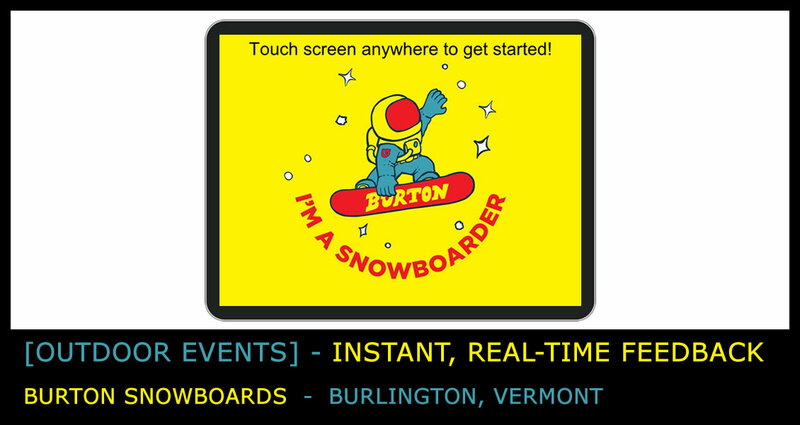 The Burton brand includes different products and messaging for snowboarders based on age, gender and ability level. With the marketing machine built and ready, iCapture provided the way to identify who gets what message based on demographic information. iCapture’s software eliminates the need for Wifi and paper forms, making remote data capture a breeze. iCapture safely stored data on the iPads until the crews got back to the office and reconnected to the internet. Data was then instantly available via spreadsheet. No paper or double handling of data required.